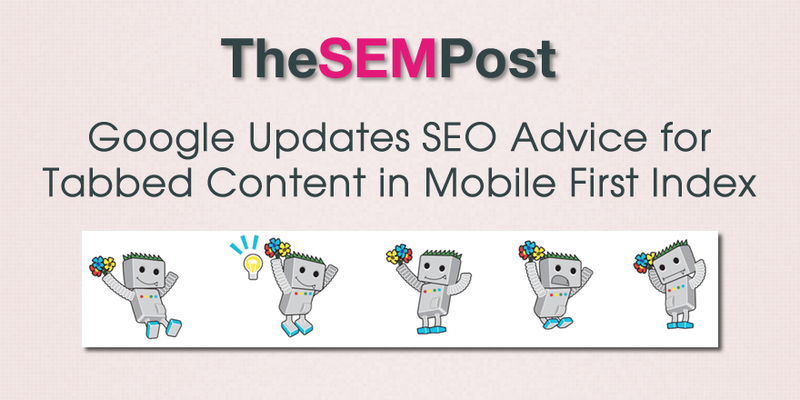 Google has previously confirmed that for mobile first indexing, having content in tabs is fine. It makes for a better user experience on smaller mobile screens, so Google has been clear that they don’t tend to demote content behind tabs, something that had been done on desktop sites. In the last Google Webmaster Office Hours with John Mueller, he added a new piece of information for content within tabs on a page – that content needs to be loaded within the source on the initial pageview, it cannot be loaded later upon user interaction with the page. As long as this content is loaded when the page is loaded, that’s perfectly fine. If the content is loaded only after you click on the tab and it stays on the same URL, then we wouldn’t be able to use that content for indexing, so that’s one thing to kind of keep in mind. I have heard of sites that actively want to use this like that, in the sense that they have some content that they want to load in a tab separately and that they don’t want to have indexed at all and that might be an option as well. Google did not previously state this when talking about this previously, although for some SEOs it would be known that if Googlebot doesn’t see it on initial crawl, then the content would not be available for indexing and then ranking. But some site owners might not be aware of how their tabbed content on mobile devices is being implemented, so the reminding site owners to check this is a good thing. If you are unsure about how Google will see content in tabs, using Google’s Fetch and Render tool should make it clear whether Googlebot is able to index the content or not.